The Chinese company Edifier obviously has a plan to dominate the world in this segment. The same is quite known in our market(Amazon). It was founded in 1996 in Beijing and soon became the leader in the production of 2 + 1 and 4 + 1 speaker systems in China as well as speakers for use with the computer. In 2000 the first 5 + 1 system with decoders and remote control was introduced and production expansion was established in 2001 in Shenzen. Growth is striking and Edifier by 2013 becomes the leader in the Chinese market in its 50% stake. New products come in the Debut series and 2007 management of the company moves up to Shenzhen while working in parallel in Beijing. At the same time Edifier starts planning a new manufacturing plant in Dongguan and comes out on the stock market. In August 2010 the new factory is ready and all production lines move to the state-of-the-art plant. In 2011 the company founded the Edifier Music Foundation through which young and talented musicians were awarded. 2011 marks the first acquisition of renowned Japanese STAX headset manufacturer. From 2013 until today the company is constantly investing in new products and their portfolio is growing. More than obviously, serious money was invested in this project, but the owners knew what was missing and did not save money to compensate for it. They did not have a “know how” and a sound name in the engineering team that would help in placement on overseas markets.In that sense, Phil Jones and Peter Duminy were engaged. Phil Jones’ biography is certainly interesting and peculiar, although the fact that he constructed AE1, the most prominent speaker from Acoustic Energy’s portfolio and residents of the Speaker’s Hall, speaks for itself. Peter Duminy gained his experience working in Rogers, Bowers & Wilkins and Audio Research, so the Chinese knew what they should do and did not save the money. The investment paid off – it shows the growth of the company, the marketing position as well as the sound of the speakers we tested. 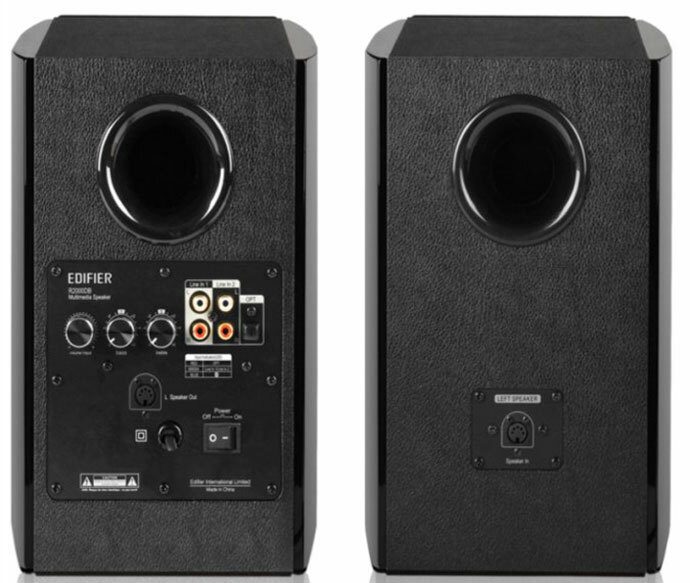 The subject of the test is a couple of active mini-monitor speakers that, apart from the fact that they are active in their configuration, offer two analog and one optical inputs (which means that there is a D/A converter in the loudspeaker) and wireless connectivity to the bluetooth. Very practical. At first glance it seems that only one speaker is active but in one box there are amplifiers for both speakers (2 x 36W and 2 x 24W) and all other electronics (DACs, inputs, potentiometers and tones) while with other “passive” speaker you’re connected with a rather long speaker cable. The reason for this is that in Edifier concluded that it was cheaper in this way and they can can offer a more attractive price. 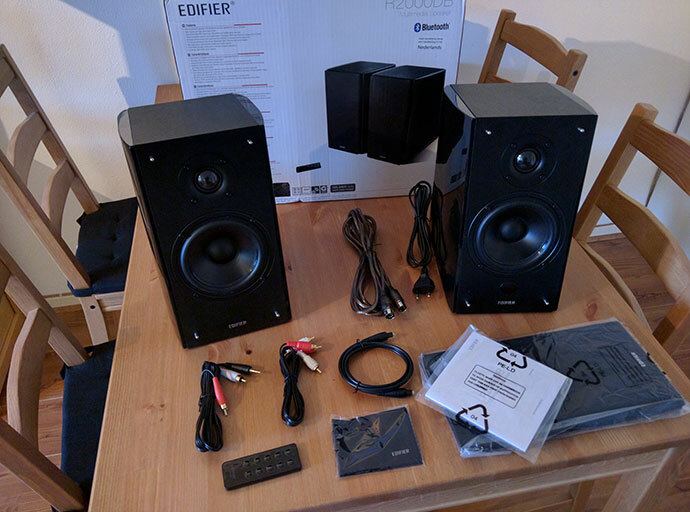 When we talk about the price Edifier R2000DB stands at 1990.00 kn for a couple which is really more than a good price when considering the complete package. Bas-midrange and tweeter look more than good for the price class and the complete design is appropriate. Sloped front side, besides what looks attractive, certainly helps with the correct time domain. Who else thinks about that for this price? The speakers are supplied with a small-size remote control that you can use to adjust the volume, select the source and turn on and off the speakers. At the bottom of the remote control you have two cool keys (classic and dynamic) that you can influence the type of sound. Classic mode can be called some linear mode while in dynamic mode the bass is slightly amplified and the sound gets a loudness character. Certainly a nice option when listening quieter. When I look back at the introduction and it is more than obvious that it is a genuinely simple and practical product. Enough is to store music on a smartphone or tablet from which you can either connect with a bluetooth or 3.5mm to RCA jack and listen to music. 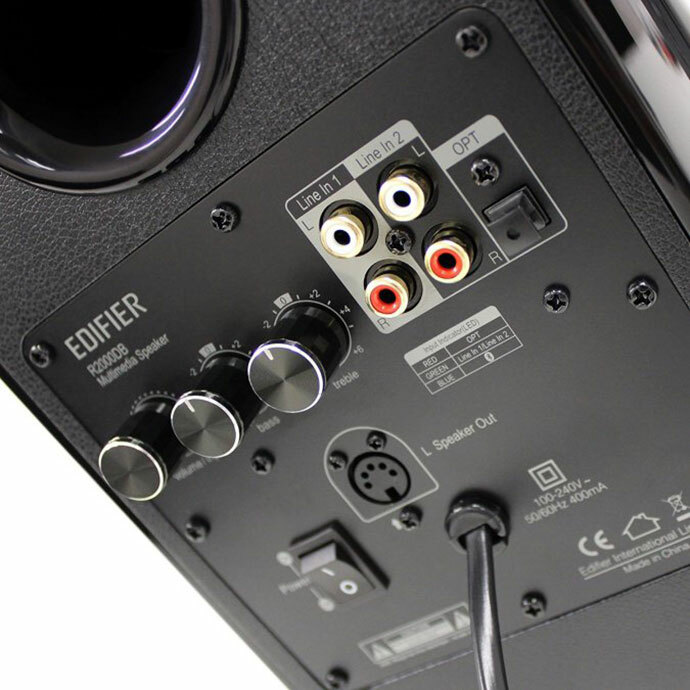 An additional optical and RCA input allows you to connect your TV to the speakers or any other source if you have it (TV, CD or DVD player). What more to ask for? This approach in the design made me to test the R2000DB in different circumstances than I did otherwise. One part of the review is done in the listening box I usually do while the other part is done in plain conditions with a TV set and IPTV receiver as sound sources. Let’s be realistic. It will be hard to find such speakers in the homes of classical audiophiles, but they will surprise the quality of those who usually have entry level systems. The second described setup seems more realistic so it is interesting to see how the speakers will sound in theoretically unfavorable conditions. In my career I often had the opportunity to listen to active speakers of similar or higher prices and mostly remained disappointed. My disappointment was right with the knowledge that the money was paid for serious passive hi-fi speakers, so it seemed logical that it was difficult to make the active speakers for the same amount of money. With a few exceptions that confirmed the rule (and for more serious money), I lived in the belief that there is no hope for active speakers although in the theory should take precedence over passive. But R2000DB has been shown to be the most pleasant surprise for the money. The greatest credit for this belongs to Phil Jones. We can see that the speakers are designed by someone who knows how to do it and who understands that a good speaker is not just good measurements but it is necessary to do more than that. The sound character goes to the softer side so that all the records are reproduced very comfortable and easy to listen. 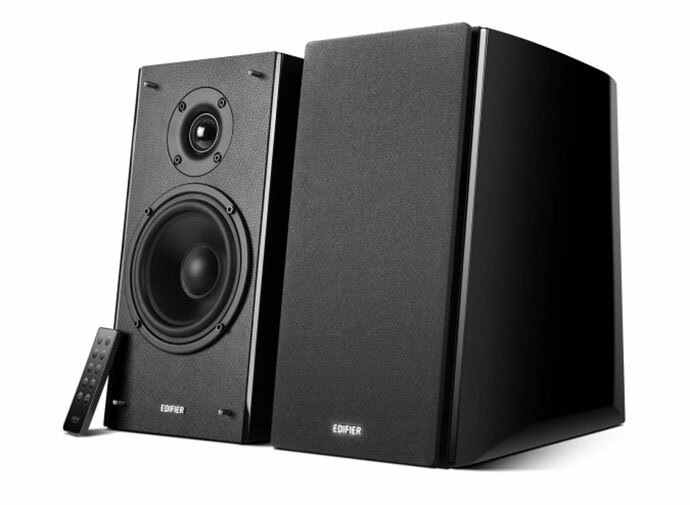 The Edifier R2000DB is one of the most enjoyable surprises in a lot of time. Given the price, sound, quality of production and the convenience of use, these speakers will give a lot of headaches to the competition. A lot of invested money and experienced and celebrated design team are clearly a winning combination. Excellent sound in class, convenience and simplicity. Nothing in this price class.